On Friday, February 27, Chaminade Girls’ Basketball hosted Long Beach Poly for an Open Division semifinal, while the boys’ team traveled to San Luis Obispo to challenge Mission Prep in the Division 4AA semifinal. At Mission Prep, Chaminade held a lead through the third quarter, but lost the game, 77-75. On Sunday, March 8, the team will find out if has received a state playoff bid. 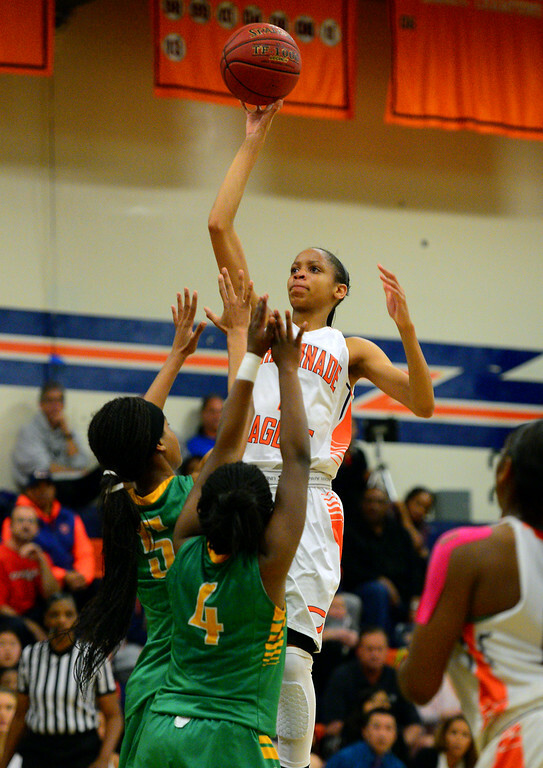 The girls’ team faced Long Beach Poly at home and came away with a 77-66 victory. They will face Mater Dei in the Open Division Final on Saturday, March 7 at Azusa Pacific University. Tipoff is at 7:30 p.m. Pre-sale tickets go on sale Thursday, March 5 through Friday, March 6 at 3:00 p.m. in the Athletic Office on the West Hills campus. Tickets prices are $13 for adults, and $7 students and children. View the Los Angeles Daily News photo gallery. This entry was posted in Athletics, Girls Basketball, High School by Chaminade News. Bookmark the permalink.